Last Sunday, I got telling the folks of Trinity Church a bit about the Celtic Calendar and about St. Brigid. 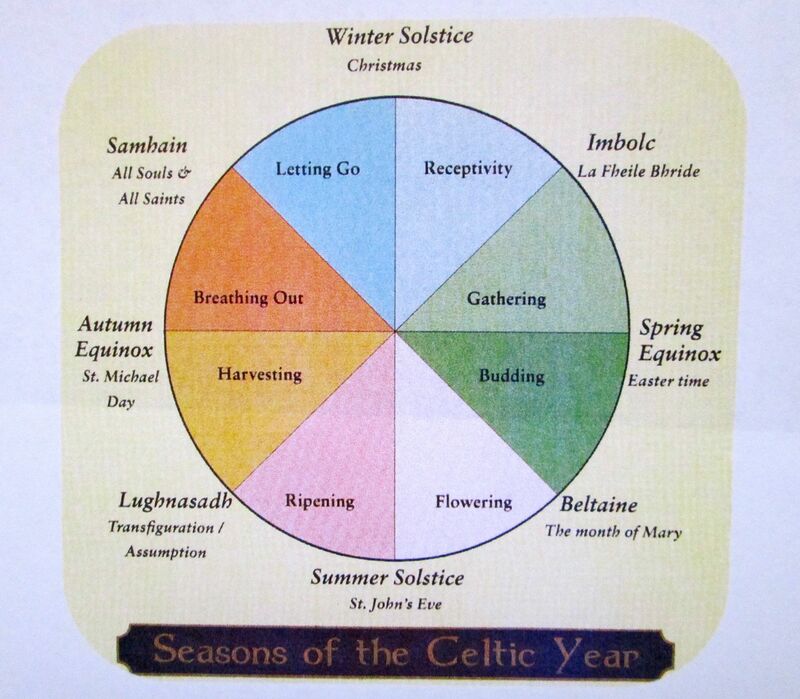 Imbolc, on the Celtic Calendar, is tomorrow, February 2. It is a day that honors the waning of winter, laying as it does on their calendar half way between the winter solstice and spring equinox. It is a day that honors the celtic goddess and Catholic saint, Brigid. There are lots of wonderful legends about Brigid, among them is that her cross of straw, made every year anew on Imbolc, can help to provide you with protection and light. The candle in the featured image of this post is the St. Brigid candle that Mary Meighan, our celtic guide, lit for us each of the nine days she led us in our celtic pilgrimage. For Patricia and me, Brigid, has to do with light. We still have the candle and light it on special occasions. We will light it tomorrow night as we have dinner. We will ask for blessings upon you. Thoughts of Brigid and Mary, Imbolc and winter’s waning, the darkness and the light, led me on this first night of February, 2016, to “seven pictures of light” from our 2012 time in Ireland for you to enjoy. With each picture there is a description of the location of the image and there is a question, seven in all, for you to ponder. Sunset on Dingle Bay, the North Atlantic on the west coast of Ireland, looking toward the east coast of the USA. What have been your favorite settings of the sun? Rainbow, looking east across Dingle Bay from Kells toward Dingle. Which rainbows have inspired you to greatness? Fog settling on the Gap of Dunloe in County Kerry, Ireland. Who/what do you trust when you can’t see, for sure, where you are headed? Ancient stone walls separating Irish fields, some in the shadow of overcast skies and some in the direct sunlight of a break in the clouds, south of Dingle, Ireland. What are the ancient walls, dividing this from that, within your soul? Nine stones leading across the Glendasan River to Riversdale B&B in the Glendalough Valley of Ireland, south of Dublin. Thank you, Liam and Zell. We spent nine days and nights in the stone cottage to the right of this picture. What are nine stepping stones of your spiritual journey? Keeeeeeiiiiiiiiiiiiii! Patricia’s joy, on the rugged coast of Dingle Bay, the North Atlantic, the town of Kells on the Ring of Kerry, County Kerry, Ireland. What do you know of joy . . . and when? A rose and a ribbon left in prayer at the ancient sacred well of St. Brigid not far from Kildare, Ireland. Who will you pray for tonight because you have read this post? so that stranger and friend may come and warm her/himself at it. Your beautiful images and words pluck the strings of my inner harp and vibrate throughout my being. Thank you, dear woman of music in Northport and beyond! I particularly like the scene of the house by the river where you stayed..and the pure joy of Patricia on the rock! A wonderful trip for you. Thank you, Connie. I love “Patricia’s Joy” too. We continue to savor what Mary Meighan named our “pilgrimage” with the Irish – ancient and contemporary. Such beautiful and inspiring images! And, thoughtful words with deep questions. Thank you for sharing ! Thanks Peg . . . blessings to you and Don on this beautiful day. Marcia and I attended a presentation by Barry Lynn at the Sinai Temple and met Arlene Pearlman. She sends you her best regards. The meeting was well attended and Barry Lynn is a marvelous speaker. My best to you and Patricia. Blessings to you and Marcia! Heard from Arlene that you had gotten to the Barry Linn SRQ lecture.